In the 21st Century, our homes are full of laborsaving appliances that handle many of our chores almost automatically, letting us spend our time enjoying our families and hobbies. Those appliances are designed and manufactured to last for many years or even decades. Still, like every mechanical or electronic device, appliances sometimes develop problems and fail to perform as we expect. When that happens, many people believe the only solution is to simply replace the appliance. 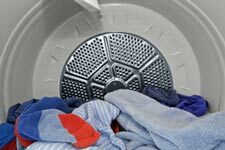 Clothes Washers – Many problems that affect washers are common and simple to repair. Belts, valves, and other components are standard service items, and our technicians can quickly replace them, restoring your washer to operate like new at a fraction of the cost of replacement. Clothes Dryers – Like automatic washers, most problems in clothes dryers can be repaired by simply replacing a defective part. Our skilled technicians will quickly diagnose the problem and let you know the cost of repairs, so you can make an informed decision. Kitchen Ranges & Ovens – These appliances are very reliable, often providing decades of flawless service. Any problems that do occur can usually be repaired quickly by a skilled technician from our full-service handyman company. When it’s time to replace these units, call on us for proper installation, including wall mounting, wiring, and gas plumbing. Dishwashers – Today’s dishwashers are expensive, complex appliances. Like many other appliances, failure of a single part can stop your dishwasher cold, or leave your dishes dirty. After a skillful diagnosis, our technicians can usually replace that part to get your appliance up and running again. Garbage Disposals – Unlike some other appliances in your home, replacement is often the solution for a malfunctioning garbage disposal. However, a jammed garbage disposal is usually easily fixed, and electrical problems with switches are a quick repair. If replacement is needed, our technicians can supply a new unit and install it quickly, at an affordable price. Entertainment System Installations – Today’s large-screen HD televisions are often mounted on walls or need to be secured to entertainment consoles. Improper installation can result in damage to equipment, or injuries to family members. In addition, all components need properly installed cabling. Rely on HandyQuick for correct installation and setup of these systems, no matter where you purchase them. Other Appliances – Call on us for repair or installation of the full range of other home appliances, from built-in microwave ovens and range hoods to basement sump pumps and whole-house vacuum cleaner systems. We’re always on-call for your needs. If you experience a malfunction with any home appliance or need new appliances installed properly and safely, call our Twin Cities handyman service. We have skilled, professional appliance repair specialists who can save you hundreds of dollars by making affordable repairs to most appliances. When you purchase new appliances, call us for expert installation and setup, and avoid possible hazards and complications. It’s all part of the full range of services we offer. One call does it all.